يينشر لكم اليوم موقع الطريق المضئ اليوم تحميل مذكرة اللغة الانجليزية للصف الاول العدادى العام الجديد 2018 , مذكرة شرح كلمات وقواعد انجليزى اولى اعدادى . 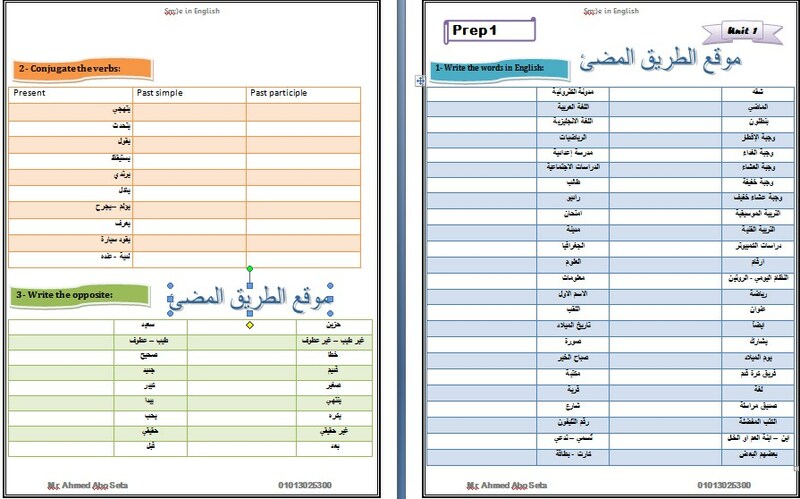 محتوى مذكرة اللغة الانجليزية لمستر محمد ابوسته اولى اعدادى ترم اول 2018. تحميل مذكرة انجليزى اولى اعدادى 2018 , من خلال موقع الطريق المضئ,اولى اعدادى 2018 . [ 1 ] I'm proud of ……………… Egyptian. [ 2 ] You can write some information in your …………….. post. [ 3 ] I live …………. Cairo. [ 4 ] I like ……………. the internet in my free time. [ 5 ] Mena is a student in a …………….. school. She's thirteen. [ 6 ] Sara and Nermeen ……………. dressed quickly before going to school. [ 7 ] I usually go to school ………….. bus. [ 8 ] We usually …………… tennis on Friday. [ 9 ] Fatma never ………………. to school on Friday. [ 10 ] Does he ………………. English? [ 11 ] I usually …………… social studies on Saturday. [12 ] What time …………… Rahma get up? [ 13] Maryam ……………… get up early. [ 14 ] In Egypt, student ……………….. go to school on Fridays. [ 15 ] Sara goes to school ……… foot. [ 16 ] We learn about numbers in the ………………. class. [ 17 ] We ………….. at school at seven a.m.
[ 18 ] We never …………… at other students. [ 19 ] Mohamed …………….. hard for his exams. [ 20 ] I usually …………… home at 3:00 p.m.
[ 21 ] Mena …………….. her hair every day. [ 22 ] How …………… do you go to the cinema? – twice a month. [ 23 ] I asked my father …………… help. [ 24 ] He often talks …………….. his cousins in France. [ 25 ] Good friends always ………………. to each other. [ 26 ] What's your date of ……………… ? [ 27 ] I like …………… in my free time. I like colours. [ 28 ] She ……………. the housework. [ 29 ] Can I ………….. you for help? [ 30 ] She speaks ……………….. well. She is from Germany. [ 31 ] I like reading. It's my …………………… . [ 32 ] Ahmed ……………. work at four in the afternoon. [ 33 ] We never ……………… unkind things to other people. [ 34 ] We play football in the ………………. .
[ 35 ] I live ……………. 12 Tahrir Street, Giza. [ 36 ] Bakers ………………. bread and cakes. [ 37 ] The old man sailed …………. because he thought he could find a big fish. [ 38 ] The fishermen were ………. because Santiago was poor. [ 39 ] Manolin helps Santiago with his ………. .
[ 40 ] The ………….. showed Santiago where to find fish. [ 41 ] Santiago was old, but he was ……………..
[ 42 ] It's important to be ………………. to catch a fish. [ 44] When Santiago was far at sea, he put his ………………. In the water. [ 45 ] Manolin's …………… didn't want him to work with Santiago. [ 46 ] The fishermen were …………… to Santiago. [ 47 ] Santiago is from ………………….. .
[ 48 ] Marlin can be about ………….. metres long. [ 49 ] He needed to catch a …………… fish. [ 50 ] Marlin lives far in the ……………….. .